Summary: Cadherin plays a role in cell cortex stabilization, a new study reports. Scientists from the Mechanobiology Institute, Singapore (MBI) at the National University of Singapore (NUS) have discovered that cadherin clusters, which are well known for forming junctions between cells, also play a role in stabilising the cell cortex. The study was published in the scientific journal Current Biology on 15 December 2016. Multicellular life depends on the ability of cells to adhere to one another. This takes place through cell-cell junctions, protein complexes that physically connect cells together. At the core of cell-cell junctions is the protein cadherin, which spans across the cell membrane, sticking out of the cell to connect to cadherins on neighbouring cells. Cadherin also attaches to the internal cell cortex, a dense layer of proteins underneath the cell membrane which has two major components: the filament-forming protein actin that provides structural stability, and the motor protein myosin that enables dynamic movement of the cortex depending on the needs of the cell. This physical bridge between cells enables the transmission of both mechanical and biochemical signals across multicellular tissues. However, scientists have observed clusters of cadherin on the cell surface which are not involved in cell-cell junctions. While it has been speculated that these non-junctional and non-adhesive cadherin clusters are being kept in reserve in order to strengthen or create new cell-cell junctions, the actual function of these clusters remained unknown. With their expertise in cell adhesion and developmental biology, Principal Investigator Assistant Professor Ronen Zaidel-Bar and Research Fellow Dr Anup Padmanabhan of MBI used embryos from the nematode C. elegans to probe the function of these non-junctional cadherin clusters. 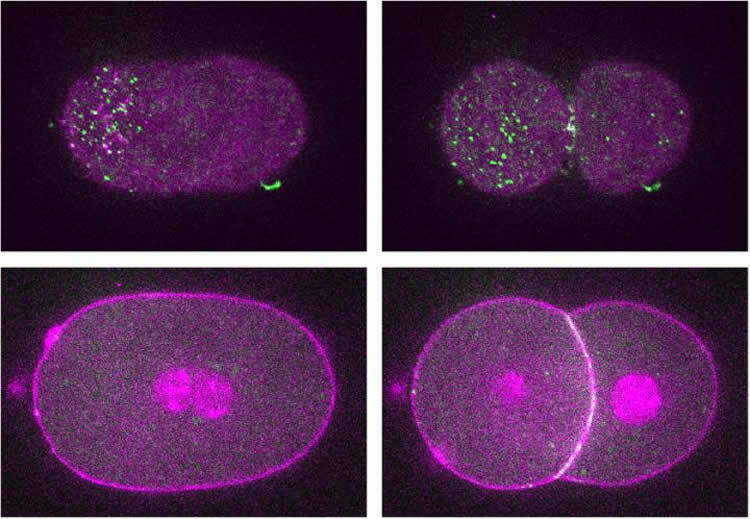 After tagging the worm equivalent of cadherin, a protein named HMR-1, with a fluorescent marker, they were able to follow its location and movement by live imaging. Focusing their investigation on the zygote, the single fertilised egg cell that develops into an embryo, they discovered that HMR-1 formed non-junctional, non-adhesive clusters similar to cadherin. Even though these non-junctional HMR-1 clusters did not form connections outside of the cell, they still remained internally associated with actin filaments of the cell cortex, but not the myosin motor proteins. In fact, the presence of non-junctional HMR-1 clusters prevents cortical accumulation of myosin and decreases the contractile activity of proteins that drive cortical movement. Surface and equatorial plane views of the C. elegans embryo. Non-junctional and non-adhesive HMR-1 clusters (green dots) are visible on the surface of a single cell and also on both cells following cell division. A belt of HMR-1 forming cell-cell junctions is observed between the 2 daughter cells (white-green line). NeuroscienceNews.com image is credited to Mechanobiology Institute, National University of Singapore. In order to determine whether non-junctional HMR-1 affected cytokinesis – the physical process by which the cell cortex rotates and contracts to divide the cell into two – the scientists genetically altered the level of HMR-1. Reducing the amount of HMR-1 resulted in faster cytokinesis while increasing HMR-1 levels slowed it down, demonstrating that these non-junctional clusters have a key function in regulating movement of the cell cortex. Analysis of cortical dynamics during cell division revealed that HMR-1 clusters attached to the actin filaments effectively provided drag against cytoskeleton movement, by acting as structural anchors lodged in the cell membrane. The importance of this anchoring in maintaining cell integrity became clear following extended observation of embryos with reduced levels of HMR-1, which were vulnerable to cortical splitting, where a segment of cortex tears away from the cell membrane. In essence, the non-junctional HMR-1 clusters can be thought of as cellular staples that help secure the cortex to the cell surface. The friction from the clusters stabilises the cortex and slows down cortical flow, preventing dramatic cortical deformation, while allowing enough cortical movement for fundamental processes like cytokinesis. This new discovery means that scientists must re-evaluate their understanding of cadherin. The importance of non-junctional cadherin in stabilising the cell cortex must now be considered along with the classical function of cadherin in maintaining cell-cell junctions. This fresh perspective may unlock new avenues of investigation regarding the role of cadherin in health and disease. Image Source: NeuroscienceNews.com image is credited to Mechanobiology Institute, National University of Singapore. National University of Singapore “Stability Without Junctions: Cadherin Prevents Cortical Deformation.” NeuroscienceNews. NeuroscienceNews, 28 December 2016. National University of Singapore “Stability Without Junctions: Cadherin Prevents Cortical Deformation.” http://neurosciencenews.com/cadherin-cortical-deformation-5824/ (accessed December 28, 2016). Classical cadherins are well known for their essential function in mediating cell-cell adhesion via their extra-cellular cadherin domains and intra-cellular connections to the actin cytoskeleton. There is evidence, however, of adhesion-independent cadherin clusters existing outside of cell-cell junctions. What function, if any, these clusters have is not known. HMR-1, the sole classical cadherin in Caenorhabditis elegans, plays essential roles during gastrulation, blastomere polarity establishment, and epidermal morphogenesis. To elucidate the physiological roles of non-junctional cadherin, we analyzed HMR-1 in the C. elegans zygote, which is devoid of neighbors. We show that non-junctional clusters of HMR-1 form during the one-cell polarization stage and associate with F-actin at the cortex during episodes of cortical flow. Non-junctional HMR-1 clusters downregulate RHO-1 activity and inhibit accumulation of non-muscle myosin II (NMY-2) at the anterior cortex. We found that HMR-1 clusters impede cortical flows and play a role in preserving the integrity of the actomyosin cortex, preventing it from splitting in two. Importantly, we uncovered an inverse relationship between the amount of HMR-1 at the cell surface and the rate of cytokinesis. The effect of HMR-1 clusters on cytokinesis is independent of their effect on NMY-2 levels, and is also independent of their extra-cellular domains. Thus, in addition to their canonical role in inter-cellular adhesion, HMR-1 clusters regulate RHO-1 activity and NMY-2 level at the cell surface, reinforce the stability of the actomyosin cortex, and resist its movement to influence cell-shape dynamics.